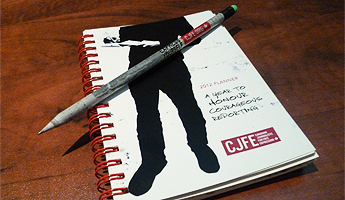 CJFE 2012 Day Planners Now Available for Purchase! Looking for the best way to stay organized in 2012? Compact, durable, and filled with information about free expression, our organizer is just the thing to start the new year off right. To order, email us at cjfe at cjfe.org. We accept credit cards, cheques and personal pick-ups at our office in Toronto. There are only a limited number of planners available, so get yours while supplies last! Price excludes shipping. Postage and handling fees are $5 for each planner mailed within Canada. Please contact us to arrange for international shipping and bulk orders.